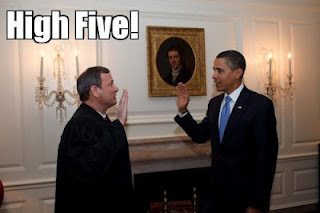 CBS has confirmed what many speculated - Chief Justice John Roberts switched his vote from a 5-4 majority with the conservative justices plus Kennedy to overrule Obamacare, to a 5-4 majority with the liberal justices to uphold it as a tax. The courts are supposed to be independent and above politics. The notion that the President, the head of a competing branch of government, could browbeat the court into a decision is especially galling. Not to mention the blackmail from the mainstream media and liberal elites, threatening the legitimacy of the court based solely on the outcome of the decision. The fact that a chief justice could be influenced by these external forces is shameful and unbecoming of the prestigious position he holds. I can't help but think such a chief justice is unfit for the role. His duty is to the Constitution, not to his own legacy, not to Congress or the President, and not to the perceptions of the Supreme Court. The perceived authority of the Supreme Court has ebbed and flowed over the last 200 plus years. It is extremely short-sighted for Roberts to think he has to safe-guard today's perception. The Supreme Court is much bigger than him, it is not going away, no matter how much the liberals pout and cry. It is disgusting to think that their threats of a temper tantrum would make him change his mind. This is similar to when liberals wanted to abolish the Electoral College after Bush v. Gore. They ridiculously want to change the rules when they don't win the game. But our institutions, while not perfect, were expertly designed and are meant to endure temporary partisan heartache. Justice is supposed to be blind, but Roberts is wide-eyed to the external pressures he is supposed to ignore. This is precisely why justices are given lifetime appointments - so that the politics of the day do not influence them. They are to have no constituencies of their own, no fickle voters to appease, their only duty is to their oath to "support and defend the Constitution of the United States." One must stand with the Constitution, not cave into the threats to destroy it. Unfortunately, Roberts does not have that kind of courage. Yes, Chief Justice Roberts is a wimp. The chief justice of the Supreme Court should not be susceptible to blackmail and professional threats. This sets an extremely dangerous precedent. How can the Constitution be upheld when the leader in charge of safe-guarding it can be manipulated? What other outrageous laws could President Obama enact in - God forbid - a second term that Roberts will feel pressured to uphold? Ironically, in twisting and contorting himself to supposedly protect the court's and his own legitimacy, he has further damaged the institution. Unlike Roberts, I can see the big picture. I know the court will endure. The question is, will the character of our once great republic under Obamacare? Well written and interesting analysis. I'm not sure we can know what his motivations were. The good news is the results will be positive for conservatives - the "Commerce Clause" has been put back in the box, and the stage is set for the repeal of ObamaCare.